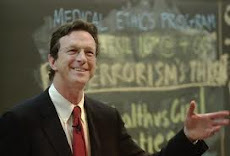 Reason magazine’s science Ronald Bailey did not agree with what he saw as Michael Crichton’s anti-technology alarmism. But Bailey’s tribute shows his respect for Crichton’s intellect and an appreciation of Crichton’s significance. Over the years Crichton and I had a number of friendly interactions as our paths crossed at various conferences. In Next, Crichton even kindly mentioned my book Liberation Biology (2005), praising it as "the clearest and most complete response to religious objections to biotechnology." Nevertheless, I have long been annoyed by the Luddite and Frankensteinian themes of his novels. I was particularly exasperated by Jurassic Park's misguided portrayal of biotechnology as being inherently dangerous. Eventually, over drinks at a conference at Cold Spring Harbor a couple years ago, I got to tell him how I thought he could have gotten the same narrative bang for his buck if he had instead celebrated the achievement of bringing dinosaurs back to life. In my alternative plot, a kindly old paleontologist, using the miracle of biotechnology, conjures dinosaurs back into existence to delight the world's children. Things go wrong only when a cadre of evil anti-biotechnologists led by Jeremy Rifkin break into the peaceful island zoo to kill the dinosaurs. This revised scenario would provide Crichton with all of the gunfire, gore, chase scenes, and satisfying explosions without the Luddite baggage of the original. Crichton fans (of which I am definitely one) can look forward to one more novel from HarperCollins. It will close out his published oeuvre but certainly not his presence, either in the world of letters or in public policy debates.